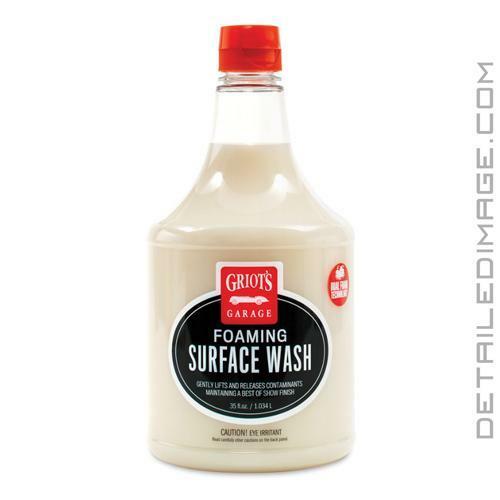 The Griot's Garage Foaming Surface Wash allows you to safely wash your vehicle, without hurting an existing protective layer! Griot's Garage worked hard to formulate this shampoo for ideal maintenance washes. The pH balanced formula is safe on existing waxes, sealants and coating, yet strong on dirt and grime. The dual layer foam technology works in two ways. The primary foam clings to the surface softening road film and organic contaminants, while the secondary foam releases and carries the abrasives to the ground. This rich foam helps you reduce and avoid ugly wash-induced swirls and scratches. You can apply this shampoo using a two bucket wash method, or for the greatest amount of foam, the THE BOSS Foam Cannon. Don't remove protection when you wash your paint, use the Griot's Garage Foaming Surface Wash and only remove dirt and grime! Select the appropriate tip: Pink Tip - Gas Pressure Washer, Purple Tip - Electric Pressure Washer, Aqua Tip - For Maximum Foam. Mixing Option 2 - MANUAL-MIX: For a traditional RTU (ready-to-use) option, add the corresponding amount of Foaming Surface Prep concentrate to the equipped reservoir, then fill with water. THE BOSS Foam Cannon: 1.6 oz, Foaming Sprayer: 2.0 oz, Pump-Up Foamer: 0.5 oz, Air Foamer Sudsing Gun: 0.25 oz. Foaming Surface Wash is a pH-neutral snow foam for pre-washing designed to rid surface of abrasives, as well as synthetic and organic contaminants, eliminating the potential for wash induced scratches. Its dual-layer foam technology is designed to gently loosen, lift, encapsulate, and release contaminants. This super concentrated formula prolongs the life of all waxes, sealants, and coatings maintaining that Best of Show finish. Useful Directions: Paint should be dry and cool to the touch. Select desired application equipment and mixing option. Maintaining a distance of 3 to 4 feet, apply from the bottom up using slow, deliberate, overlapping passes. Allow to dwell for 5 to 10 minutes. Do not allow to dry on the surface. Using a high-pressure rinse from the bottom up and top down, rinse all surfaces free of foam. Should road film remain follow preferred wash method. Dry using Griot's Garage PFM Drying Towel. Another good Griot's product. I first tried it to deal with a ton of road salt and filth, and after making sure I had enough product mixed with the water in my pump applicater and rinsing before application, it worked very well indeed. I now use it weekly to deal with the effects of the New England winter. In gentler weather there's no need to rinse the car before applying, as the directions state. This product is Great, so glad to have in my arsenal, now I know why people rate it number one, great results from another Griots product. THIS product, this product right here is simply amazing! I recently received my order of this, along with Poly Gloss, last week and couldn't wait to get home from work and try it out! My car had days of dust on it from to and from work duties and sitting outside at work, so it needed a good cleaning. For this I grabbed my IK Foam 9 hand pump, added 2.5 ounces of Griot's Foaming Surface Wash and topped off with 1.3 gallons of distilled water. I've used many carwash soaps in this machine and they all foam up pretty well but THIS product out foamed them all! This was odd because its consistency is very thin cimpared to the carwashes I've used in the IK Foam 9 previously. So i got thick foam using this product in a hand pump, think about that! I let it sit for about 10 mins and just rinsed it away, no problem. Because it just a soap it leaves nothing behind but clean, infact the finish was very sharp, very noticeable. I bought the 35 ounce bottle but when it gets low I'm buying the gallon size and ofcoarse buying it from my new go to for all my detailing products....Detailed Image!